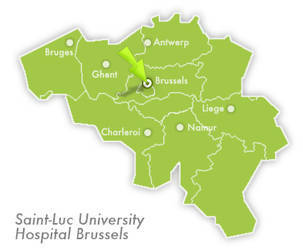 Just 10 minutes from the capital of Europe, the Brussels Saint-Luc University Hospital offers approximately 1,000 beds and a wide range of treatments. Thanks to its highly specialised teams and continuous investment in state-of-the-art medical equipment, Saint-Luc is able to treat even the most complex conditions. Day after day, our teams do their best to offer quality and support to our patients. First ever transplantation of ovarian tissue between genetically different sisters, with subsequent restoration of ovarian function and embryo development (2007). Professor Jacques Donnez, Head of the Department of Gynaecology and Andrology at the Cliniques Universitaires Saint- Luc, in partnership with his team, has also achieved other world firsts in the field of ovarian transplantation. A 38-year-old woman severely disfigured by a dog attack received a "partial" triangular graft, consisting of the chin, lips and nose. 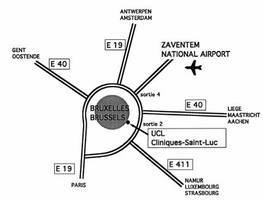 This operation was performed in November 2005 at the Amiens University Hospital Centre (CHU). Professor Benoît Lengelé, a specialist in microsurgery,reconstructive and plastic surgery at the Saint-Luc University Hospital was a member of the medical team led by Professor Jean-Michel Dubernard from the Hôpital Edouard-Herriot in Lyon and Professor Bernard Duvauchelle from CHU Amiens. World's first implantation of an electrode around an optic nerve on a blind patient in 1998 performed by the Department of Neurosurgery led by Professor Raftopoulos. 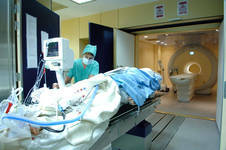 In January 2006 the Saint-Luc University Hospital acquired high-resolution 3.0-Tesla Magnetic Resonance Imaging operating equipment. This equipment is unique worldwide and has proven to be a valuable asset in procedures peformed by Professor Christian Raftopoulos and his neurosurgical team. 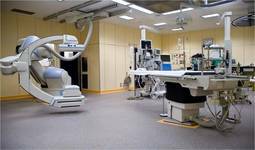 In December 2008 a brand new hybrid operating theatre for cardiovascular surgery was inaugurated. It is the first time in Europe such an exceptionnal equipment is installed in an operation block. Read more (press release in French). The hospital is indicated from these highway exits.